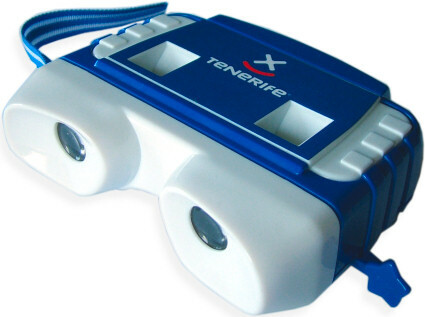 There are literally hundreds of different devices that enable the stereoscopic viewing and creation of 3D photography, far more than is within the remit of this website to be able to mention. Stereoscopy is a fascinating subject that can span across multiple disciplines. It is used for entertainment, research, science, mathematics and far more. Stereoscopy started soon after the invention of photography itself and was really popularised by the Victorians. It is very easy to find stereo cards that date back to the late 1800's. These can be viewed in a number of different devices, but the most popular of those is the 'Holmes' type viewer. A very popular method of viewing 3D pictures is via anaglyph images. This is where the red colour is shifted to one side and special glasses can then be used to fool the brain into thinking it is seeing 3D. The image being viewed isn't strictly 3D, but rather a sort of pseudo 3D. It is even possible to view objects in 3D without anything other than your eyes. This is know as free-viewing and requires the user to cross their eyes whilst looking at a pair of stereo photographs. Although the technique takes a little time to master, it is very effective. The following photographs are of items that do not fit anywhere else on this web site, but were considered worthy of inclusion. Several View-Master based children's board games were produced, such as Klomp-It in the early 70's and 3D Trivia Quiz, show below. 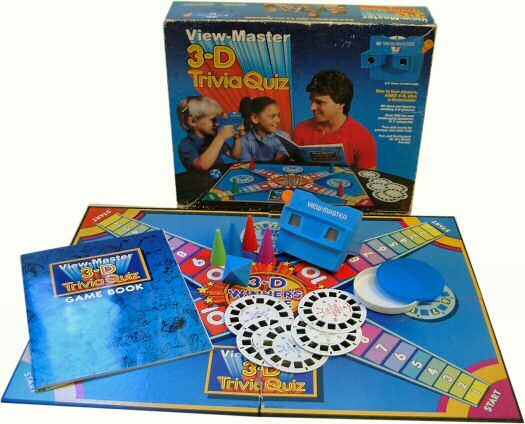 The game was produced by VMI (View-Master International) in 1984 and included a VMI Model G and seven reels. An odd-ball viewer about which little is known. It is thought that it may have been part of a medical teaching set. A Korean made Pokemon Pocket Monsters 3D Viewer which offers surprisingly good 3D cartoon images. Although this only dates to 1999, it is very sought after and this is reflected in a moderately high price. Another example of this style of viewer.